August 10 is National S’mores Day! What is a s’more, you ask? Well, have you ever eaten something so delicious that you craved some more? Of course! A s’more is a summer campfire dessert that is almost a requirement at any barbecue or outdoor cookout in the USA. 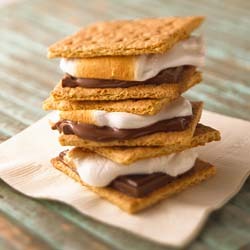 S’mores, a contraction of the phrase some more, are a popular, sweet campfire treat made of roasted marshmallows and a layer of chocolate, sandwiched between two graham crackers. And they are so tasty that normally people want a second serving, or some more (s’more). S'mores are popular because the simple ingredients make a perfect balance of flavors: the marshmallow is gooey and sweet, the chocolate is smooth, and the graham cracker is crispy and crunchy. The treat was originated by campers in the early part of the 20th century, using a rather new mass-produced product, marshmallows. Marshmallows were easy to transport, as were candy bars and graham crackers, and they could be toasted without difficulty on a stick over a fire to make a delicious treat in a situation where other types of sweets would have been difficult to prepare. So mark August 10 on your calendar for S’mores Day and make sure you plan your barbecue with the essential ingredients on hand for this super sweet summer treat.